The northeast monsoon remains subdued over the South Peninsular region, and this pattern is likely to continue for the next 2-3 days. A fresh low pressure is likely to develop over South east Bay of Bengal in the next 2-3 days, which might lead to a revival of the NEM rains in the first week of December over parts of South East India. Moderate to dense fog likely at isolated places over NW India, Gangetic plains and NE India. Above normal day temps and below normal night temperatures are likely over parts of the South Peninsula. Most parts of TN are likely to experience dry weather with warm days and cool nights. Day temperatures are likely to be well above normal. Night temperatures are likely to fluctuate between near normal and slightly below normal. 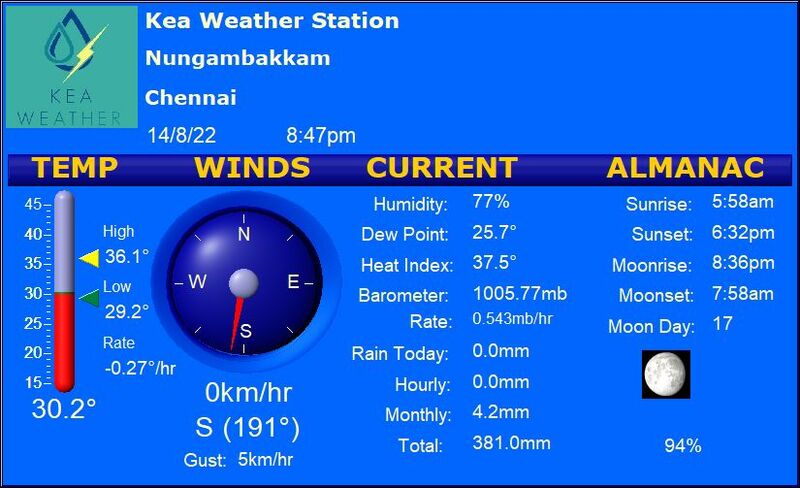 Chennai – A warm day with a partly cloudy sky, followed by a cool night. Maximum of 32 degrees and a minimum of 21 degrees. Coimbatore – A hot dry day, with a maximum of 34 degrees and a minimum of 20 degrees. Madurai – Another abnormally hot and dry day likely with a partly cloudy sky. High of 35 degrees and a low of 22 degrees. Trichy – A hot day with a high of 35 degrees and a low of 22 degrees. Vellore – A hot dry day with a high of 32 degrees followed by a cool night with a low of 18 degrees.